First off this is based on the classic book, and one of my favorite books which in my viewpoint should be required reading. George Orwell’s 1984. 1984 deals with Nationalism, the future, heavy censorship, and most all big brother watching everything, a.k.a. surveillance. 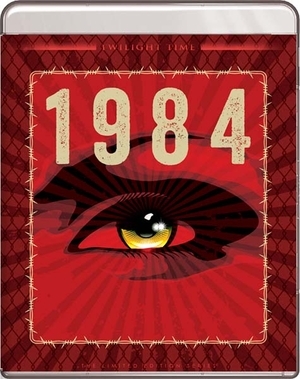 The book is often titled 1984, the movie titled 1984, originally in book form tilted Nineteen Eighty-four. The film stars one of the greatest actors in the cinema world. The much underrated and often overlooked John Hurt. This British drama also stars the truly amazing, gifted, one of a kind Richard Burton and the stunning Suzanna Hamilton. The plot of the film is set in a control super state known as Oceania. It is maintained and controlled by Thought Police. Your main character is Winston (John Hurt). Winston works at The Ministry of Truth. His jobs are to change history by re-writing it, which they are told by the main controller the supreme Big Brother what to write and change. Winston can’t help himself. He thinks for himself, keeps a diary for his thoughts. This is outlawed and illegal. You can’t think for yourself. By creating a diary, and thinking, he has created a Thought Crime. Soon he meets a girl named Julia (Suzanna Hamilton). There they begin an affair, which is outlawed. They talk, think, feel, go through emotions, which is all an outlawed reality. Soon through many meetings and love making, their relationship is full force. They adventure with illegal food, clothes and live inside a little world of freedom, but all around them, control and the Thought police. Soon their world is turned upside down as the Thought police invade. This is a classic tale told through the lens of a film camera. A classic book bought to life. Twilight Time has honored this film with an absolutely beautiful, lovely blu-ray. This is a great new outlet to this classic often overlooked film. Extraordinary in acting, by all involved. John Hurt is a brilliant performer that I have always loved greatly. This is film legend Richard Burton’s last film. He always brought to life thought provoking, intense characters, and the character of O’Brien in 1984 is no different. It's sad seeing and knowing his mastery is forever silent, but as long as there are awesome companies like Twilight Time to express important pieces of film, his legend will live on. The cinematography is something that has to be mentioned. Mentioning who is behind it should make film lovers know of it's importance. The award winning, one of kind master Roger Deakins. Deakins is the very definition of cinematography. He not only helps create eye opening moments in films, he leaves a mark of mastery on his films. From working with directing masters like The Coen Brothers, and many others, always capturing breathtaking imagery. From the masterpieces Fargo, The Shawshank Redemption, No Country for Old Men, Homicide, A Beautiful Mind and so many others. He also did stunning cinematography on films that might not be masterpieces of cinema but shine with his expertise in his craft such as 1993’s The Secret Garden, the stunning cinematography in 2004’s The Village, 2015’s amazing imagery in Sicario. Just a breathtaking example of beauty and wonderment for an art form that is cinematography, and I feel 1984 shows that beauty in great detail. I have never understood the Academy Awards not letting him win. As of this writing he has been nominated 12 times, and has not won. Thankfully in 2011 the American Society of Cinematography awarded him with a Lifetime Achievement Award. He deserves all the awards he can get. A true master. Twilight Time did another awesome release. I have waited for this film to enter the Blu-ray realm, and finally it has done so, on an excellent 3,000 Unit special edition, that shines in beauty and darkness of the subject matter. Twilight Time has created a whole new outlet through imagery, quality, and for that, it’s a must own, must experience new product of an awesome, futuristic tale of a world controlled, manipulated, and ordered to follow. The film is a wonderful example of a darkened setting. It's uses massive grey and dark colors to create a twisted raw setting of almost like destruction, decay, hollowness. The Audio and Video is a flawless example of how to treat and give the best quality available to an older film, and express it with a new product. This blu-ray sounds perfect, looks dynamic, comes together in a flawless way. Ear candy to the ears, eye candy to the eyes. Slim Pickens on this one, but has to be talked about. The movie had two Soundtracks or scores originally. One being the Orchestra version, the other being the music score by the wonderful, amazing, legendary group The Eurythmics. This blu-ray comes with both versions. The Orchestra version and the Eurythmics version. I prefer the Orchestra version, which is the default version that plays, but is great to be able to hear both versions, which is a huge added plus. The all-important Orchestra music score adds such a great emotional setting to the darkened film. The man behind this music is a wonderful musician, Dominic Muldowney. Muldowney has done feature film music and also TV music. His style does stand out and creates an emotional appeal to the music being displayed. He is responsible for the music on one of the long running TV Movie series. The action, adventure history series the Sharpe films, starring actor Sean Bean. As of this writing a total of 15 TV movies on this one character. I think what is so great about Muldowney’s music is it tells a story, or captures the moment being shown on screen. It’s as if the music comes to life, creates and builds emotion, and then leaves you satisfied in the end result. A fantastic special feature that Twilight Time added is the ability to hear both soundtracks. Also as always you get one of my favorite realities that come with the Twilight Time Special Edition Blu-rays, the insert Essay booklet by the film historian Guru Julie Kirgo. Kirgo has such an excellent mind and flawless writing on the subject of films. She adds a wonderful history to cinema. I love reading these booklets and look forward to them each time. A fantastic new breathtaking outlet brought out by Twilight Time. A beautiful transfer to blu-ray. The sound and video is flawless. A wonderful film that leaves a very intense and emotional reality upon the watcher. As we look around the world today, slowly our freedoms are being taken away. Slowly more and more Big Brother is coming to reality. 1984 was a landmark book, a warning for history. This movie captures that detail and displays itself in a believable undertaking through awesome direction, and amazing performances. Twilight Time has done another flawless job on this Special Edition Blu-ray.